06/09/05 "ICH" - - Every dictionary describes enemy as “one hostile to another; one who hates another; a foe; an adversary; an antagonist; a hostile force, army, fleet, or the like.” The enemy’s goal is to destroy anything that comes in the enemy’s way that would prevent such an enemy from the achievement of set goals and purposes. Hence, any person or group that performs actions that are detrimental to our environment, to our very own life may be viewed as our deadly enemy. Regardless as to whether or not Americans as a whole perceive it, we may single out the ten deadly enemies of the American people and of all people of all nations as a matter of fact. These are ten American largest corporations whose product is virtually lethal. They put in danger not only the people who work for such industries but also those who are directly or indirectly affected by their deadly products. They are all linked to wars and they all view peace as their outright enemy since peace would eventually render their product obsolete. This means, they would not cease embracing their Satanic God, known as the never-ending-accumulation of wealth and money. These top deadly enemies make billions of dollars annually on the premise that the end justifies the means. To this end, they employ psychologists to study the mood of the people and to come with advertisement proposals so as to present their product deceitfully to the people. They want the American people either to accept it by all means or, at least, to remain indifferent about it. There is only one thing they do not want absolutely, namely, to see people openly critical against their deadly product. In this presentation, we are not going into details on the nature of the deadly product of such ten big corporations. We are simply going to pinpoint them and bring them into the open for everyone to see and comprehend. We hope that those who are interested in the preservation of our environment and life would investigate on their own the extent of irreversible damage these monsters of our earthly society are procuring. We are going to enlist them briefly and to explain what they do with a brief comment on how their product leads to the destruction of our environment and of our life. Needless to say, the fact that they may produce good product should not be a justification of their continued existence the way they are. 1. Lockheed Martin Corporation, better known by many as Lockheed Martin Aeronautics Company, is located in Forth Worth, Texas. This company chose to specialize in the manufacture of military aircrafts whose job is to devastate entire nations mercilessly in the name of national security, peace and world stability! It produces F-16 Fighting Falcon, the versatile air-lifter C-130J Super Hercules, the stealth fighter F-117 Nighthawk, and the next generation fighter F/A 22 Raptor. All these are meant to be used not by civilians for positive and constructive purposes, but by the military for negative and destructive activities. 2. Boeing Company is viewed as the largest aerospace company in the world. It is commissioned to make commercial jets that it sells to any nation that wishes to purchase such a product. Although Boeing tries to stress the word “commercial” in its advertisements, it is also in the business of making military aircraft and missile in addition to phantom works. It tries to justify its product as an effective means for the United States to defend itself against the enemy. Here we need to ask: Who is the enemy? At one time the answer was: The Soviet Union. However, after the Soviet collapse they came out with another enemy known as the rogue states, which consist of a group of some five to six banana republics where people are starving and are having surmountable problems. Like every other big industry, Boeing is primarily concerned with profit. To this end, it would not object to provide every single nation on earth with its product as long as involved nations would pay the right price. Confronted with such a reality, the concept of nationalism and patriotism for Americans becomes literally meaningless. And to distract the American people from the industry’s malicious intent, the stress on the concept of patriotism emerged to be popular. This explains why nowadays you see some of the top executives in these deadly corporations, along with top US government officials, wearing an American flag pin on their chest. 3. Northrop Grumman Corporation works under the guise of national security, civil and industrial needs by providing advanced information technology systems whose ultimate goal is to make American wars more devastating as to kill the maximum amount of people possible with the least effort. Among other devices, it has developed Kinetic Energy Interceptors Missile Defense Battle Management Capabilities. This company has made the waging of wars as its source of income. Behind the scenes it makes sure that wars are constantly taking place, even if it had to provide weaponry systems to potential enemies and then instigate them to use them via third parties. This would be needed to give them the excuse to start a devastating war where everyone, including Americans, would be a loser and no one a winner. We need to keep in mind that in the United States both individuals and corporations have the freedom to make money the way they want. This policy has enabled the manufacturers of all kinds of weapons to develop into lucrative businesses no matter how much their product would prove to be detrimental to innocent people. After all, as we learned from the Iraqi war, the massacre of innocent Iraqis in tens of thousands has been referred by American politicians who support fully the weapons industry not as victims but merely as collateral damage, like people were a piece of discarded furniture. 4. General Dynamics Corporation is one of the major military contractors. Recently it was awarded $900 million contract for the production of 2.75 inch rockets from the US Army Aviation and Missile Command, Redstone Arsenal, Alabama. This corporation, like other similar ones, is in the business of air and water pollution and of hastening the road to Armageddon. 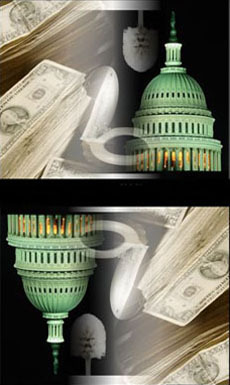 Under the guise of peace, General Dynamics continues to fleece the US government of tens of millions of dollars, money that would have been used constructively to provide homes for the homeless, give our children adequate health care and education, and enable researchers to find remedies to such deadly maladies as cancer, heart disease, multiple sclerosis and epilepsy, among others. General dynamics is headquartered in Falls Church, Virginia and it employs over 70,000 people worldwide. In 2004 it had revenue of over $19 billion dollars. Its lethal product is used for expeditionary combat systems, armaments and munitions as well as shipbuilding and marine systems among. This corporation is responsible for rockets that can be fired from a variety of rotary and fixed platforms that include, among others, US Army apache and US Marine Corps Cobra attack helicopters. One of the best sources to see what this corporation, along with other deadly ones mentioned in this presentation, is doing would be the internet. 5. Raytheon Company specializes in high technology with operations in commercial and defense electronics, engineering, construction, aviation, and major appliances. This company has embarked on advertisements that show the company’s concern for the “needs of the people” starting with giving assistance to families of US military men in Iraq. At the same time, this company supports the Ballistic Missile Defense System. Most of its war products are in testing today. In spite of its effort to establish a good image as being humanitarian and peaceful, Raytheon does nothing positive and constructive for peace in the sense that it works for the prevention of war rather than for the waging of war. The idea that these deadly enemies in America of our earthly community would work for a genuine peace through the development of a program of international disarmament and arms control not only it does not exist in their agenda, but the very thought of it may be easily dismissed as craziness! This company, like the others enlisted in this presentation, has people trained in talking with top government officials by presenting them with videotapes showing how the development of more sophisticating and devastating weapons would enhance the national security of the United States. Unfortunately, most of the US government officials, mostly Republicans, fall easily into trap and concede to allot more and more money for more and more weapons and wars. 6. United Technologies Corporation claims to be a $37 billion company whose products include heating and cooling fire and security systems along with Pratt & Whitney aircraft engines, Sikorsky helicopters and UTC Power fuel cells, among others. As stated earlier, these deadly corporations are in the business of making money through the production mostly of devastating lethal products. Recently, Sikorsky S-92 helicopter won Korean Presidential competition. This type of helicopter is now sold to South Korea. United Technologies Corporation states that what it manufactures is merely for national defense and security of the United States and of all the other countries that purchase such products. There is no war machinery whatsoever that is said to be manufactured for purpose of the destruction of the infrastructure of nations and the massacre of numerous innocent people. When this happens we already know what they would say relative to the horrendous crimes that are committed against innocent people in every way. It’s merely collateral damage! The best contribution that this company could do is to get out of the war business, the sooner the better. We need to develop an international program of disarmament and arms control. At the same time, we need to leave the job of international relations and peace in the hands for world-wide humanitarian organizations and out of the hands of the government’s officials. 7. Halliburton Company claims to be one of the world’s largest providers of products and services to the oil and gas industries. No wonder it moved so quickly to take hold of the oil in Iraq shortly after the American invasion and occupation. This company employs 100,000 people in over 120 countries. These people are primarily trained in drilling and formation evaluation, fluid systems, production optimization as well as digital and consulting solutions. Over the past several years, this company made it clear that it wants to be second to none in technological leadership, operational excellence as well as innovative business relationships, and dynamic workforce. Three of the most dangerous and abusive companies in the USA are the trio corporations consisting of the weapons, oil and construction companies. They seem to work hand in hand. The weapons industry destroys the infrastructure of a nation such as it has been in Iraq, then the oil industry steps in to take charge of the existent oil of such nation and other rich natural resources when available, while the construction company steps in to rebuild what the weapons industry destroyed successfully. Needless to say, these three big corporations seem to work hand in hand like they were a mafia type of organization. 8. General Electric Company seems to be one of the most astute companies in the world when it comes to the advertisement of its product. It focuses on products that are mostly used by the general public, like bulbs and refrigerators. When it comes to the products that are harmful to people, it tends to play it cool and hardly makes any public advertisements. This company has some $500 billion dollars in assets and has business in 47 nations around the world. It has been heavily involved in nuclear weapons emitting toxic wastes that made countless thousands of people have numerous health problems many of whom died prematurely. A videotape report was made to illustrate this reality entitled: Deadly Deception. This videotape report was produced by a concerned private humanitarian organization known as Corporate Accountability International, and could be contacted at 46 Plympton Street, Boston, Massachusetts 02118. This organization has been very active in protecting the life of ordinary citizens whose air has been dangerously polluted by big corporations that included lately the giant oil corporations of Exxon/Mobil, and Chevron/Texaco. It also got after other big corporations like Coca-Cola, which has been draining all of the pure water they can get hold on, and tobacco giants like Phillip Morris whose structured deceitful advertisements about their lethal product has hooked millions on nicotine most of whom were sent to their grave already. General Electric Company remains a very dangerous company because of its involvement in nuclear weapons. 9. Science Applications International Corporation is the largest employee-owned research and engineering company in the United States. Like the other mentioned big corporations, this corporation is also involved in military ventures. Just recently it signed a contract with the US Air Force to provide system engineering and integration support for the Joint Mission Planning system (JMPS) for a period of 12 years. The contract exceeds $200 million dollars. The ultimate purpose would be to make US military missions, as they are called, more effective. In plain words, the objective would be for the US Air Force to become more devastating in future wars on any regional or global scale. Some of the work that is performed deals with health care, energy and telecommunication. Needless to say, each of these deadly companies do provide services that could be termed to be positive and beneficial but such services do not seem to be the focus of the company as a whole. Besides, this giant corporation is trying to work hand in had with military vehicles, homeland security as well as anything that goes under the titled of national security, whatever that may mean since such a phrase has been so much misused and abused in the past. Some of its major clients may be enlisted as criminal justice, space ventures, which may include control of weapons in space, and effective transportation in addition to others. 10. Computer Sciences Corporation provides mostly consulting, systems integration and design, and software for industries and for governmental requirements. Although this corporation is also involved with health services, its focus seems to be on aerospace and defense dealing with weapons and military equipment for purpose of waging of endless wars. The US government spent billions of dollars on this industry at the expense of the American people’s health care and education. Such money could have been used to improve Americans’ quality life through the elimination of hunger, the provision of homes for the homeless, and the cure of diseases that are killing Americans unnecessarily. According to the United Nations report on the children’s state of health in every country, one out of five children in the USA suffers from malnutrition and hunger. As stated by retired top military commanders of the US Center for Defense Information in Washington, DC, these big military corporations are not primarily concerned with the defense of the American nation, nor of any other nation as a matter of fact. Their primary and only concern is profit as stated eaerlier. When the Soviet Union collapsed the United States was given the opportunity to bring about a permanent world peace through the development of an international program of disarmament and arms control. After all, this has been a major goal of the United Nations since its establishment in 1945. We are submitting a list of names and addresses of main offices of these top ten deadly enemies of humanity in America in the order of billions of dollars that were made out of the manufacture and sales of military ammunitions and weapons of mass destruction during the year 2004. In conclusion, the American people have the sacrosanct duty to bring these ten deadly enemies of humanity in America under control by refusing to manufacture weapons and deadly military equipment and to insist with such corporations to replace without delay their lethal products with constructive items that would be beneficial to all people without exception.